I've been playing some clicker heroes for a while now, but right now I'm away from my computer for about a week so I'm playing on my laptop. on my computer I had some simple macro programs build into the keyboard, but there's no such thing on my laptop, so I've been using autohotkey for that. right now I've a very simple script for 4 keybindings that activates the skills in a certain order, but since I'm using autohotkey anyways I'd like to automate this process aswell so the script will automatically loop these skill combinations for me. as you can see, I'm no coding genius, so I've no idea really on how to improve the script. sleep 500 ;comment out if you want, I noticed all your hotkeys had 500 sleep though. does it matter to what delay I set it to? I tried changing it but it didn't seem to change anything really. I've been thinking if it's possible to improve the script some more... would it be possible to have it so when the automatic skill chains are activated, the script would autoclick for you, though it'd be a bit more than just autoclicking. you'd start with placing the mouse cursor ontop of a buy button of a hero. when you start one of the automatic skill chains the mouse cursor would move a certain amount of pixel to the right and start autoclicking. 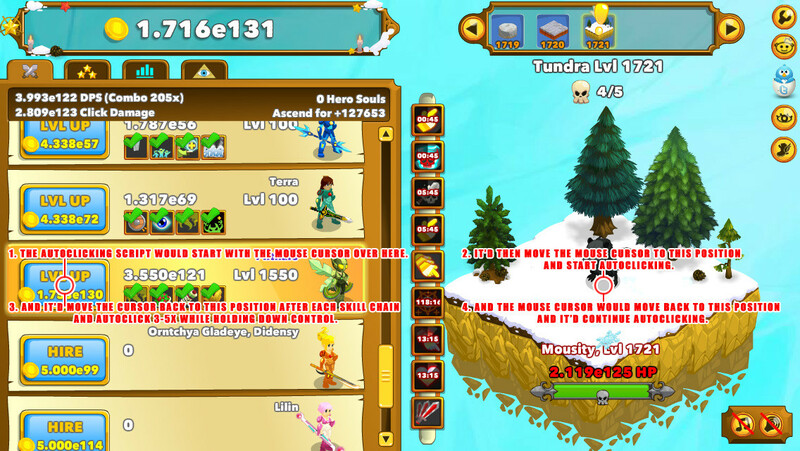 but each time after it casted a skill chain, the mouse cursor would move back to the original location (the location of the buy button), autoclick about 3-5 times while holding down control (holding down control when buying levels for a hero allows you to buy 100 levels at a time instead of 1), and then move back to the right at the amount of pixel that you've set it to so it continues to autoclick. if possible you could be able change how fast the script would autoclick for you by changing the value in the script because there's a maximum amount of clicks that Clicker Heroes will register and I don't know if the developers are planning on changing this in the future. if possible could you also be able change the amount of pixels the mouse cursor would move to the right, because I have Clicker Heroes running in a seperate window that I resize so it can run along with other program windows that I've open, but if I run Clicker Heroes on another system I may resize the window to a different size. as it may be a little confusing what I've been trying to tell here I've tried to explain it in this screenshot aswell. this addition to the script would greatly help me for the times that I have the automatic skill chains running when I'm AFK and be able to progress alot further in the game because the autoclicker program that I now have only allows me to autoclick on 1 position, so that'd mean I can now only either autoclick on the buy button for heroes, or autoclick on the monsters, but if this could be added to the script I'd be able to do both.